It was first time trying out Ais Tingkap, or Window Sherbet in English. 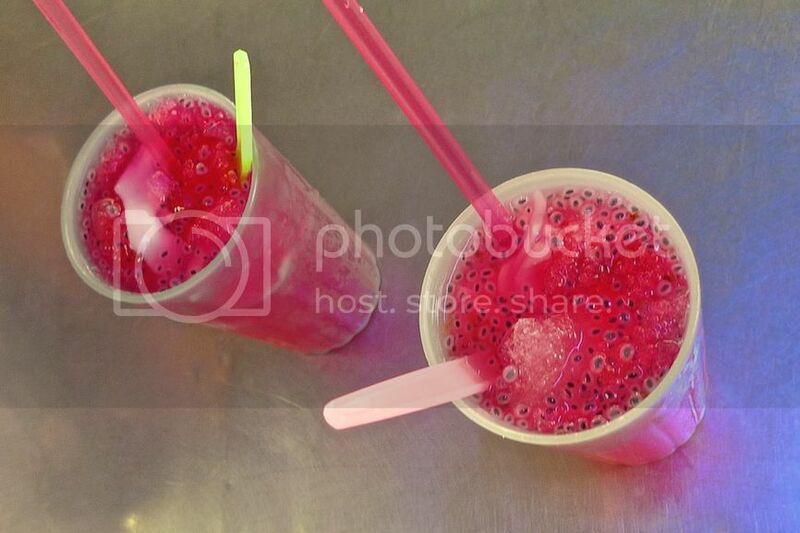 It looks like a rose syrup drink but filled with coconut flesh and basil seeds. I believe the drink is unique to Penang and you can't find it anywhere else. 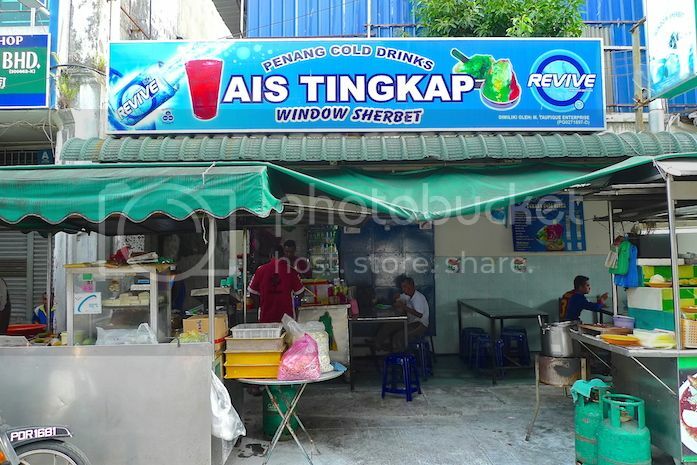 If the name Ais Tingkap or Window Sherbet sounds weird, well that's because it was originally sold through a window back in the 1930's! 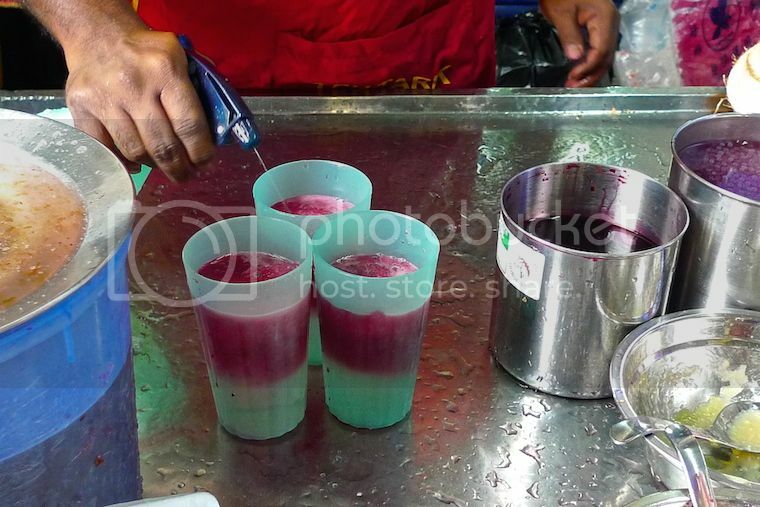 Many thanks to Penang bloggers Ken and Ann who admittedly had not tried this drink before, but was willing to help me search for the stall located along Tamil Street beside Chowrasta Market. I had the opportunity to see how Ais Tingkap was made. 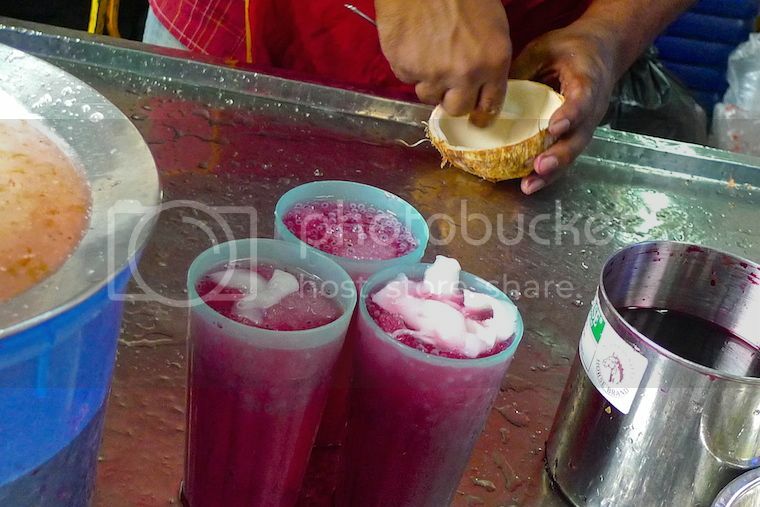 First, the cups were filled with shaved ice, liquid sugar, and syrup made of rose essence. Then a spoonful (or more) of each of these three pre-soaked ingredients were added into each cup - biji selasih (basil seeds), kembang semangkuk and getah anggur. 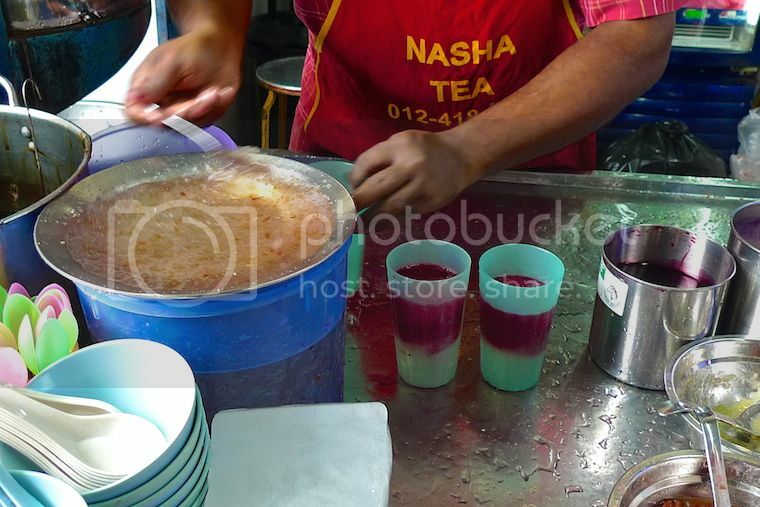 I'm not sure what you call the kembang semangkuk in English but it literally means 'bloat in a cup' because when soaked for about an hour, the inner flesh breaks through the skin and bloats into a jelly-like texture. The getah anggur (literally means 'rubber grapes') is actually olibanum gum - a type of resin obtained from a tree bark in India. This needs to be soaked for a day and it will bloat into a transparent, jelly-like mass. After that, fragrant Indian herbs and root mixture were sprayed. Then, coconut water was added. And coconut flesh too. Lastly, the drinks were topped with more shaved ice. This is my Ais Tingkap drink. See those tadpole-like eggs? They are actually biji selasih (basil seeds) that expanded into these translucent gel shapes when soaked for about 20 minutes. How should I describe the drink? Well, it was refreshing, sweet, and aromatic with nice chewy texture from the basil seeds and getah anggur. I would say it's a perfect drink for a hot day! And it was indeed a hot day in Penang. Having spanned three generations, this family business is still going strong. Starting with the grandfather who moved his sherbet business from Sri Lanka to Penang in the 1930's, followed by his son and finally to the grandson and his brothers currently running the business. Although originally 25 different types of herbs were used, now it is reduced to just a handful due to the difficulty in getting the supplies from India. 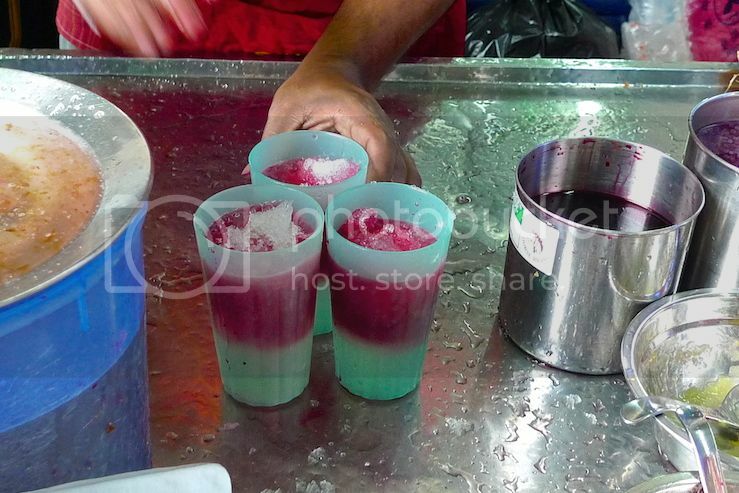 If you ever visit Penang, do not miss this very unique cold drink by the name of Ais Tingkap.